The following instructions assume you have already set up at least one Chinese language and keyboard, as described on the input methods setup page. 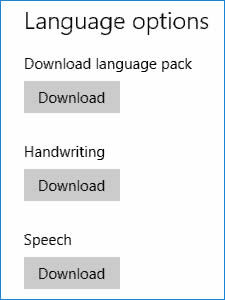 As of Windows 10, you do not need to download display languages - "language packs" - unless you want to change the Windows Start menu and other system feaures into another language. 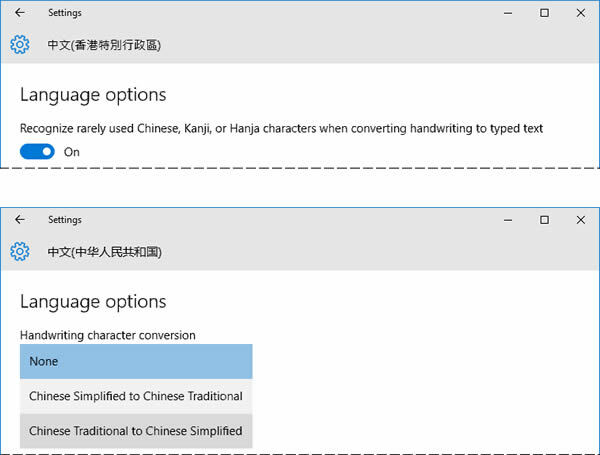 In Windows 8 and earlier versions, Chinese handwriting was bundled with the language pack downloads, even though language packs have actually never been required to make Chinese handwriting work - or Chinese typing or reading for that matter. If you begin at the Language menu and select "Language preferences" as shown here, you will be able to download these items separately. You can also get to the same place via the Start menu: click "Settings" > then in the Settings panel click "Time & Language", and in that panel go to "Regional settings". If you are using the classic desktop language bar, I suggest that in this situation you use the Start menu Settings path described in the previous paragraph. 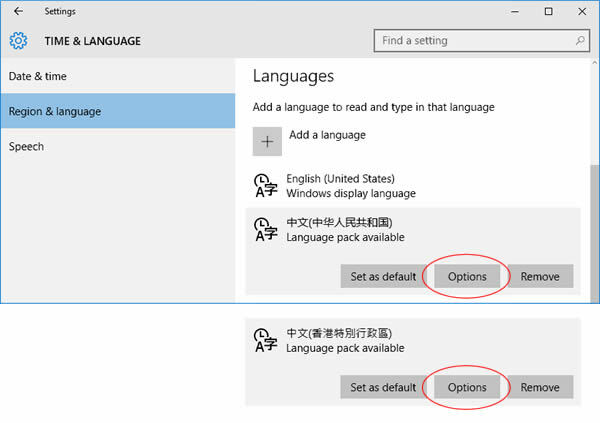 In the Taiwan and Macau region settings, the old-style desktop control panel will not offer you the handwriting or speech downloads, because - as of the Windows 10 launch, anyway - in that control panel they are still bundled with the language pack, and in the global Windows release, the language pack is not available in the Taiwan or Macau regional settings. For that, you need to select Hong Kong, PRC, or Singapore in your language setup. But in the following new settings panels, handwriting and speech are available separately. Both Simplified and Traditional handwriting are available in the new Touch Keyboard handwriting mode. Most of the information below focuses on that feature. The Traditional Chinese IME Pad is covered in detail on the advanced features page. On this page we'll continue discussing the new handwriting features in Windows 10 only. 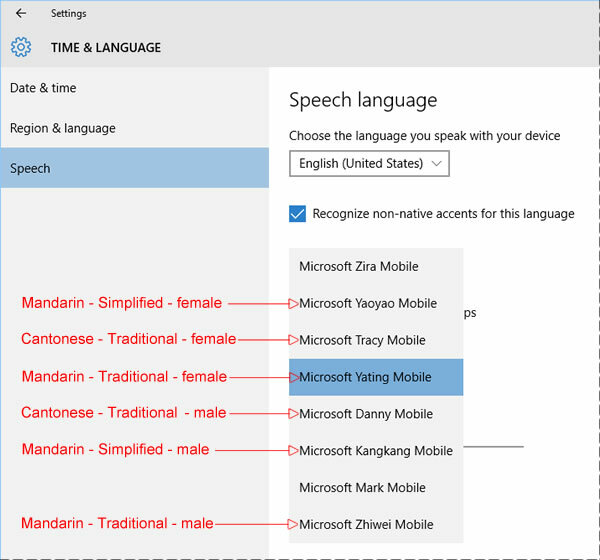 The Simplified Chinese IME Pad never supported handwriting, only radical and punctuation lookup, but anyway that IME Pad is missing from Windows 10 at launch. I track items like that in my FAQ article titled Missing, Broken, and Just Plain Lame Chinese Features in Windows 10, and will update that list as things change. • in your Simplified Chinese language options, you'll find an optional automatic Simplified/Traditional or Traditional/Simplified converter. The Traditional Chinese "rare character" option disappeared from my system after the July 2016 one-year Anniversary Update. Perhaps now it's the default? It should be: limiting the number of characters was a goal for older systems with memory and speed limitations most of us no longer have to worry about. The Simplified Chinese options also include "recognize italic handwriting" option. "Italic"? That may or may not be intended for Chinese, unless it somehow also helps with cursive/grass characters. There is separate setting for "personalization" that may be more useful: see "To train handwriting recognition" below. To start using the handwriting feature, you'll need to find the touch keyboard. select "Show touch keyboard button". and this is the same touch keyboard after I clicked the control circled in red to minimize the size. When in this mode, the touch keyboard can also be dragged anywhere on the screen. On my basic Chinese input setup pages you'll find more about customizing the Touch Keyboard for handwriting and phonetic input. To train handwriting recognition to better recognize your own style, go to the classic Language control panel. From where we are in the above screen shots, go back one page to Settings and then click the bottom link that says "Additional date, time, & regional settings." Or, you can enter "Language" in taskbar search and select the control panel offered at the top of those search results. On the classic Language control panel, proceed to the options for a Chinese region. 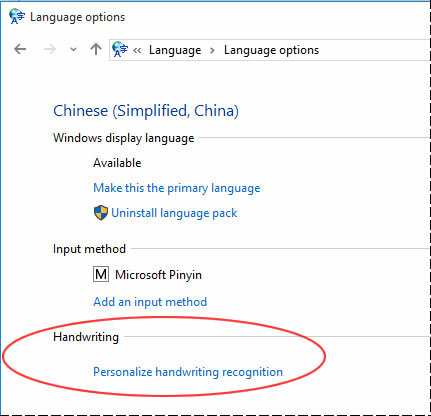 On in the Language options panel, click on "Personalize handwriting recognition". It will then walk you through the entry and sampling of some characters to help it learn your handwriting personality. OK? That's all I've got on the handwriting feature. I don't use it much, and from the examples above you can probably tell why. There's a reason they call me "Pinyin Joe". :-) But feel free to send questions, comments, or suggestions anytime. After you start downloading the speech features, you'll notice there are two kinds: speech recognition, and text-to-speech. The options for this are in the Speech section of Time & Language settings. At the top, you'll find the language menu, and an option to recognize non-native accents. Given the wide range of accents among even native Chinese speakers, I recommend everyone check that box. At the bottom of the same settings panel, you'll find a button for getting started with speech recognition, and a link to more settings in the classic control panel. I have not done any of this. I seldom use this feature, but I did give it a try, only to discover that I have no idea how to put these new voices to work. As of the Windows 10 launch, Windows Narrator and Office Speak retained their own lists of voices, and those lists were seemingly unrelated to the menu shown here. I'll have to explore this further when I have more time, but for all I know this may be fixed in a future update. Please let me know if you understand how this is supposed to work. 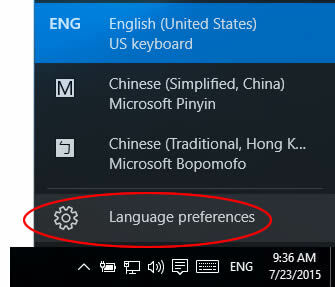 Language packs change the Start menu and other parts of the system into another language. That's all they do. They are not necessary for reading and writing Chinese, and they will not fix apps with garbled text or other communication problems. 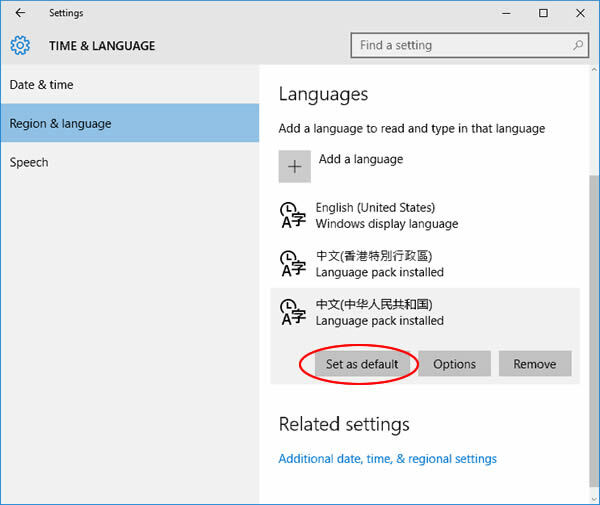 After a language pack is downloaded, you can switch to that display language anytime by going back to the Languages section of Time & Language settings, selecting a language to reveal the three buttons, and then selecting "Set as default". You don't need to restart, just sign out and sign back in again (or as we used to say, log out and log in). But "Sign out" is not on the power button. That would be too easy... Windows 10 hides this in two or three places, and I will show you one here. OK? Good luck finding your way home again, Dorothy. :-) Just kidding. In the new Windows 10 settings panels, everything is in exactly the same place in all languages. So, just follow my instructions above. 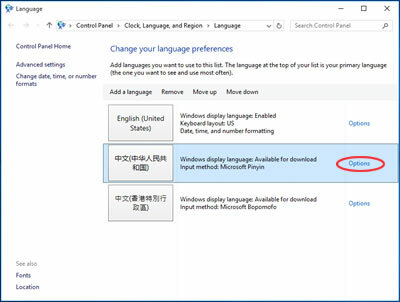 When you get back to that last right-click on the Start menu, look in the same place for "Sign out": “注销(I)” in Simplified or “登出(I)” in Traditional Chinese.